A hazelnut crust is a simple way to dress up goat’s cheese and is complemented by the sweetness of the warm Stonewell apple sauce. This recipe is an ideal starter for two people and can be easy adapted to serve more if needed. 1. Divide the goats cheese into 25g portions and roll into balls. 2. Place the hazelnuts, chilli flakes, and brown sugar on a plate and mix together. 3. Roll balls in the hazelnut mix. 4. Next make the Stonewell apple sauce; peel and dice apple and grind in lime zest and ginger on top of apple. 5. In a saucepan, melt the butter and add the chilli paste, ginger, diced cooking apple and Stonewell cider Medium Dry into a pan and allow to come to the boil and cook until softened. 6. 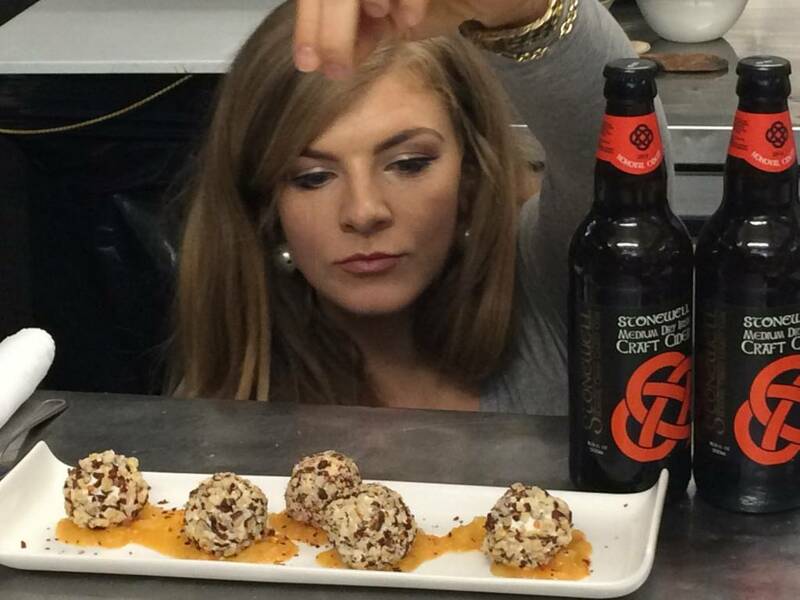 Add a little more cider to the sauce if needed and serve warm with the goat’s cheese balls placed on top. 7. Top the dish with leftover chopped hazelnuts. If you try our recipe we would love to hear what you think! Tag us @stonewellcider so we can see your creations!